The Crete Golf Club near Hersonissos is the only 18-hole golf course on the island of Crete and one of the most impressive courses of the Mediterranean, which holds a unique challenge and a pleasant experience for both golf players and visitors all year round. It is easily accessible from Heraklion Airport within 25 minutes (24 km). The course has been built to international PGA standards by architect Bob Hunt. Each hole has been constructed separately and in harmony with the surrounding landscape, providing panoramic views of both the mountains of Crete and the Aegean Sea in the distance. The Crete Golf Club has a mountain-style layout, it is meticulously maintained and at the same time it provides an ideal venue for international tournaments. As of 2012 The Crete Golf Club is an official venue of the Ladies European Tour Access Series. It has also hosted the EGA Mens’ Challenge Trophy with great success in July 2008, while for 3 consecutive years it hosted the Aegean Airlines Pro-Am. The Crete Golf Club has electric golf carts and electric trolleys that ensure a continuous and fast pace of play. Competitions are organized on a regular basis and visitors of The Crete Golf Club are welcome to participate. The climate in the area is very mild all year round: The altitude ensures a light, cool breeze in high summer, making the game very pleasant, while in winter there is very little rainfall and the average temperature is between 15 – 20°C that rarely goes below 12°C on the coldest day. The Academy of the Crete Golf club is the only golf academy in Greece that has state-of-the-Art equipment for swing and putting analysis and club custom fitting, all done only by certified PGA Professionals. 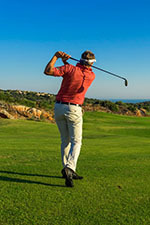 The Academy of The Crete Golf Club also offers club repairs and golf lessons for both beginners and seasoned players. The Crete Golf Club’s practice facilities include a double-ended Driving Range, 2 practice Greens for putting, 1 practice Green for chipping, and 1 practice bunker. The Pro-Shop of the Crete Golf Club prides itself on having a wide selection of golf apparel and high quality rental clubs for both men and ladies, both right- and left-handed. Before or after the game, players and visitors can relax and enjoy their meal and drinks on the large outdoor terrace of the luxurious clubhouse, overlooking the little lakes next to the Green of 18th hole, with a view of the Lassithi Mountains in the background. From Heraklion drive East on the "New National Road", the E75, with direction towards Agios Nikolaos. At the intersection of the Lassithi plateau turn right (south) following the direction towards Kastelli. Drive 2.5 km and The Crete Golf Club lies on your right hand side. Driving time from Heraklion: Approximately 25 minutes. Pass through Hersonissos with direction to Heraklion taking the "Old National Road". At the intersection towards Kastelli, turn left (south) and drive straight on, approximately 5 Km from the above intersection. The Crete Golf Club lies on your right hand side. Driving time: Approximately 7 minutes.